Troggg, Clare Blake and Brett Hansen in the 4BC Studio4BC Afternoons would like to introduce you to Brett Hansen and Troggg. 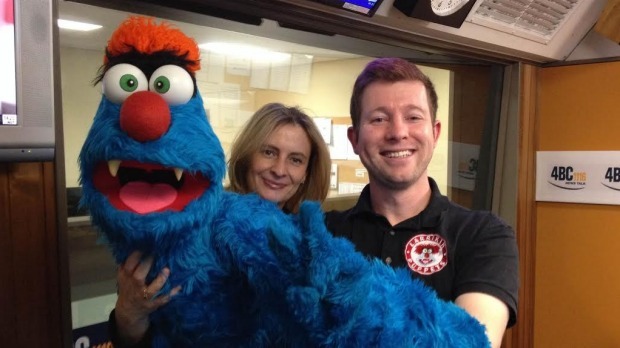 4BC Afternoons would like to introduce you to Brett Hansen and Troggg. And just to clarify Troggg is the blue one and yes, the middle ‘g’ is silent! Both Brett and Troggg are from Larrikin Puppets and they dropped by to tell Clare Blake all about an upcoming film screening that will raise money for a very good cause. The award winning film ‘I Am Big Bird: The Carroll Spinney Story’ documents the man who has played Big Bird and Oscar the Grouch on Sesame Street since 1969 and understandably is very close to the hearts of both Brett and Troggg. The screening aims to not only provide a night of entertainment but also to raise funds for The Queensland Centre for Gynecological Cancer Research. A worthy cause which has touched Brett on a very personal level. This special screening will be hosted by Troggg (and Brett) and will be dedicated to the memory of Helen Jean Hansen.